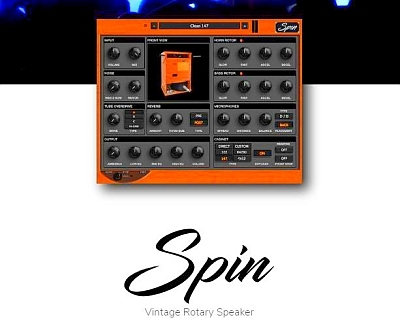 GG Audio announced the release of Spin, an incredibly detailed simulation of several classic rotary speakers. Spin includes the Leslie 122 and 147, the usual high-powered model and the famous Yamaha RA200. When your sound passes through a rotating speaker, something magical happens and there is nothing like it. If you prefer a tone with some overdrive, Spin will come in handy. 3 separate simulators of the classic 40-watt amplifier contained in a 122/147 rotating dynamics, give you a little warmth to something crisp and right up to the well-known "hot eggs". Why 3 versions? Because different sets of lamps lead to slightly different characteristics. We arranged them in order of increasing advantage. We also turned on the High Gain setting, which simulates the famous British guitar amplifier, appreciated for the amplification and distortion style, more suitable for the Steppenwolf and Jon Lord types of sounds. Spin comes with a great simulator of classic 122 and 147 rotary speakers, but we went a step further with a custom version of "high power" that simulates a rotating cabinet that was previously available only to professionals. Although it is very similar to classical, it has its own sound. For something a little unusual, pay attention to the cabinet RA200. Based on a rare cabinet, this is a unique rotary speaker with 3 rotary woofers and 2-15-inch woofers. Spin is also equipped with a simulation of a British guitar amp cabinet with 4 – 12 "speakers. Every engineer has his own special way of capturing sound from a rotator, and Spin has all the possibilities. Close the microphone for an intense and pulsating sound or for something smoother. Move them away for a dreamy stereo distribution or set them close together for a mono output. Place the microphones in the front of the cabinet for a smooth tone or back of the cabinet for a slightly larger presence. Spin also allows you to choose between dynamic and condenser microphones. Classic 122, 147 and "high-power" modeling. Modeling cabinet British guitar amplifier. Reverberation with room sizes and Pre & Post modes. 4 microphones, including a selection of capacitors. Fully adjustable rotational speed, acceleration and deceleration. Turn on / off rotor diffuser. System requirements: Windows 7 or higher / Mac OSX 10.9 or higher.